The certified Magento developers are all set to offer Magento 2.0 servicers that have just been rolled out at the company with a heavy discount. 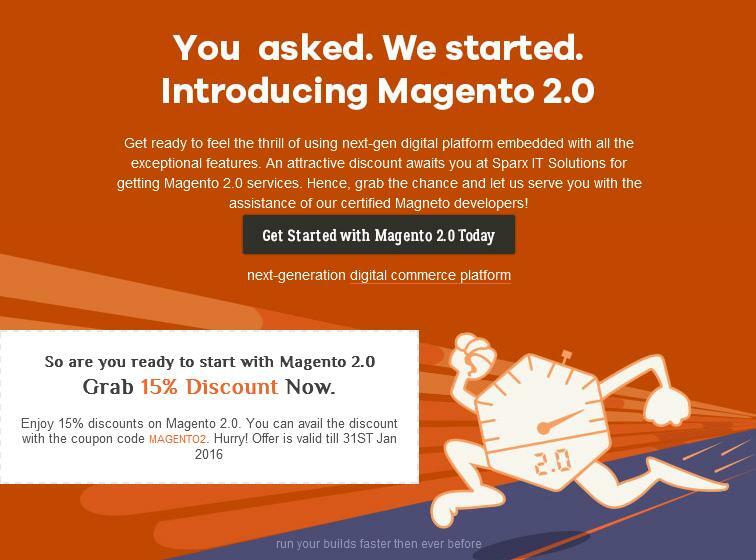 NOIDA, India - Jan. 22, 2016 - PRLog -- 22-Jan-2015- India - The introduction of Magento 2.0 services at the Sparx IT Solutions carries a great news to offer to the clients. The services have been introduced with a heavy 15% discount with the coupon code “MAGENTO2”. It is an exceptional opportunity to grab as such a ravishing discount rarely knocks your door that too when the services have just been rolled out. Magento 2.0 is outstanding in its own way. This new version has got a number of reasons for the users to upgrade to the same. A lot of improvements have been done to make Magento as much user-friendly as it can be. This current version is much faster in terms of adding products to the carts. In order to offer the best experience while making the payment, online payment gateways have also been integrated securely. The benefits with this version have also been extended to improve table locking system and code base for taking the users’ experience to a whole new level. Our company has always focused on offering the optimal benefit to the users with every new service launch. The promise has also been kept this time so that we can again win the hearts of the users who are hiring the outstanding 2.0 Magento services from us. Quality is again optimal, which users can experience by hiring our expert developers for the related concern. There is a little time left with the clients to get the advantages as services are available only till 31st of Jan 2016. Thus, there is no reason for letting such attractive offer go and therefore, we request the users to get the share of benefit with our feature-rich solutions. We are just a call away from you to leverage some outstanding service benefits. For getting the information in a detailed manner, you can drop your queries to us. Awaiting to serve you with professional assistance!